Choosing bridal shower tableware is often an easy decision. Base it on the type of party you're planning. Consider your theme, if you have one. 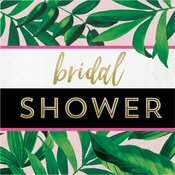 Your bridal shower party supplies will help to coordinate your event. When looking at your options, you'll have a variety of colors. You might decide to mix and match, or keep everything monochromatic. Decide what will work with the look and feel you are trying to achieve. Lace or linen are elegant choices for more formal settings. These come in a variety of colors to match your decor. Use the same color on all tables to unify the look. Paper tablecloths come in an array of colors and designs. These are great for casual themes. When looking at bridal shower party supplies, you might choose a solid color, or a pattern that goes with your theme. Linen napkins have a formal feel. They will give your place settings a dressed up look. You may wish to use solid color paper napkins personalized with a monogram, or guest of honor's name and date of the bridal shower. 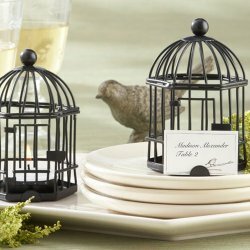 Find this bridal shower tableware at Napkins.com. Paper napkins are also available in a wide assortment of designs and themes. These are often used with linen napkins. They may have a sleek simple design or have an embellishment attached. You may want to use napkin rings to dress up your solid colored paper napkins. *** A great bridal shower tableware idea, is to use a floral napkin ring, add a name tag, and let this become the take-home favor. Whether you are having a formal or informal event, place cards add an extra touch to your dining area. White or cream, as the main color works well in most cases. Then add a place card holder that compliments your theme. A formal party would use china, glass or ceramic plates. Paper plates come in a variety of colors and designs. These are often used for more casual parties. However, don't be afraid to use paper plates, for semi-formal affairs. They keep your plans, and clean-up, simple and stress-free. If you are using real dishes at your party, use real glasses for a coordinated look. You can mix and match for an eclectic look, or keep them all the same. Paper cups or plastic are fine for informal parties. Silverware complements china, while plastic can be used with paper plates. Plastic comes in many colors...so mix and match for a festive look. Remember when using plastic to purchase an extra amount. Guests sometimes toss plastic ware, and you don't want to run short. *** Make sure you spell all guests names correctly. Use your bridal shower tableware to enhance your decorations.